Her eyes were glittering and her cheeks were pink. This was Daisy with a Plan. Schoolgirl detectives Daisy Wells and Hazel Wong are at Daisy’s home, Fallingford, for the holidays. Daisy’s glamorous mother is throwing a tea party for Daisy’s birthday, and Daisy’s eccentric family are all invited, from eccentric Aunt Saskia to dashing Uncle Felix. But it soon becomes clear that this party isn’t about Daisy at all. (Naturally, Daisy is furious.). I read the first Wells & Wong Mystery with a mixture of surprise and delight: I had not expected a Malory Towers – Holmes and Watson mash-up to be quite so enjoyable. I have now to add that this follow-up is even better! 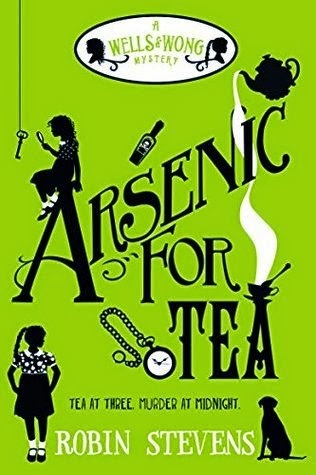 So often sequels can be a disappointment, but Arsenic for Tea is definitely not. There is still the same fun, still the same intriguing relationship between Daisy and Hazel (though it does develop further in this one) and still the same convincing portrayal of 1930s England. This time we have the classic country house set-up, butler and all, and as well as the Cluedo elements, there is an understanding of the effect such awful events would have on a family. As before, Robin Stevens does not Photoshop some of the more unpleasant aspects of that era – there’s one snobby line in particular that actually made me gasp! Having said that, there’s enough humour and cleverness to keep any competent reader happily entertained. The plans and summaries are a useful feature for any sleuths keeping up with our heroines. Likewise the addition of Kitty and Beanie as Assistants to the Detective Society help us to follow what’s going on – and add to both the mystery and the laughter. I have always had a soft spot for books with glossaries and the like – and Daisy’s Guide to Fallingford is a joy. Like the first book, you don’t have to read it to enjoy this story – but it might well increase your pleasure as it did mine. I can’t really say much about the plot – the whole point of a mystery is that it remains, well, mysterious. The only two points I will make are that all does make sense in the end – and that I am so looking forward to First Class Murder in summer. It’s set on The Orient Express! Decidedly recommended for any historical mystery fan – the Wells & Wong books are best read in order, but Arsenic for Tea works perfectly well as a standalone.